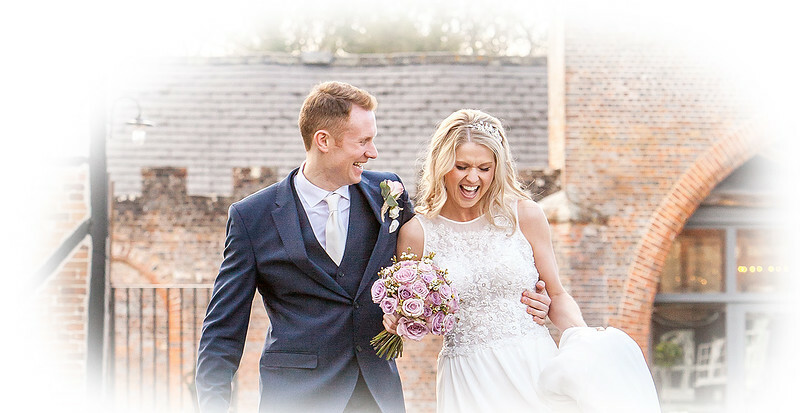 As a professional Hampshire wedding photographer I be exhibiting at most of main wedding fayres in the area, where any bride & groom can visit for an informal discussion about our approach to wedding photography. Here are all the 2019 dates, so do stop by the stand for a chat or you can contact me now to arrange a personal presentation here at my home in Chandlers Ford Eastleigh. Daytime & evening appointments are available. What are they saying about Darren Matthews Wedding Photography? Keisha & Simon - When my wife and I first met with Darren we were struck by the passion he had for photography, and this passion never faltered in all our meetings with Darren. The passion is evident in the photos he takes and his rapport with the people he is photographing. We have recommended him to friends and family and cannot speak highly enough of Darren and his wife Sue in the work they do. We were immensely impressed with the service and finished product and loved the personal touches that he infused in our photographs. We would have no hesitation in using Darren again in the future for any photography we need doing. Rowena & Sam – Hi Darren and Sue, we’d just like to say a massive thank you for our wedding day. The photos were amazing and really showed who we are as a couple. We loved the way you just let our families quirkiness flow and some of the best photos are the natural ones you and Sue captured without us noticing. We appreciated that you didn’t try and force us into strict ‘Kodak’ moments’ but just let us be us, which meant everybody loved the day and the photos being taken. We’re definitely going to be recommending you to our friends, as for us you’re a great choice for couples who love to have fun with each other and show their personality. Big thanks again! Lisa & Simon - The photography of your special day is so important in capturing all those special memories created in just one day. Darren delivered! Can’t recommend his photography enough! A delight to work with and plenty of smiles! Karleigh & Andrew - Hi Darren and Sue hope you are both well, just want to say a massive thank you for everything you did to make our Wedding day even more special. You were both fantastic people to work with and we really felt comfortable and happy to have you there on our big day. The photos of our Wedding were amazing and everyone still comments on our Wedding album at how well it was put together and captured every moment of our day, we do keep it on show still after a year as we are so proud of it!! I want to say another massive thank you on behalf of myself and my Husband for making our experience the best we could have wished for, for all the time you put in with us to create our Wedding album and just for generally being lovely people. Thank you so much. Jeni & Steve - Darren & Sue really put us at ease, firstly at our pre-wedding shoot and also on the day. The fun and games started at my parent’s house and Darren was able to catch the moments of my Dad messing around and with his famous grey cardigan on under his suit jacket!! Darren and Sue made everyone feel comfortable in front of the camera and even took photos requested by guests on the day. Steve the groom added – Seriously, I hate my photo being taken, however Darren and Sue managed to keep me calm and smiling all day. Forgot they where even there. Superb end results and would highly recommend booking Darren. Thank you Darren and Sue. Catherine & Glenn - Darren & Sue were amazing on our wedding day. They instantly put us at ease and for most of the day we didn’t even notice that they were there, happily snapping away! One of our main concerns was spending too much of the day having photos rather than enjoying time with our guests but we needn’t have worried – Darren got through the necessary group shots in no time at all and was great interacting with guests and making everyone feel comfortable. Many of our guests commented on how great Darren & Sue were on the day and we were absolutely thrilled with the end results. Emma & Daniel - The wife & I had seen a few wedding photographers before meeting Darren at a wedding fayre at the Holiday Inn, Winchester. Being a keen amateur snapper myself I knew the style and quality I was after. Upon speaking with Darren we both agreed that he was a nice guy and someone we could feel relaxed with on our day. Needless to say he didn’t disappoint, along with Sue taking shots as well, the whole package Darren provides is all you should be hoping for on your special day. The pics you see here all speak for themselves, ours are all we were expecting and more. Incidentally Sue’s stash of fruit pastilles helped my dry mouth just at the crucial moment in the day. Thanks Darren and Sue. Jo & Alwyn - Darren and Sue were great on our wedding day, didn’t intrude yet got amazing personal photos for us and the whole family. The difficult part was choosing which photos to print! Danielle & Brad - We were lucky enough to have Darren and Sue doing our wedding photography earlier this year. They really are such professionals and have a great eye for a great shot! They were extremely discrete during our ceremony and we found we had plenty of time with our guests, whilst getting all of the photos we wanted and many many more. We would 100% recommend you both, thank you again. Erin & Dave - We knew the first moment we met Darren that he was the right photographer for us, easy to get on with, up front and with plenty of skill and experience. Darren and Sue fitted in so well on the wedding day, my husband and I are not ones to be jumping in front of the camera but on the day felt at ease with all the pictures taken and had great direction from Darren without being overpowering. The pictures as a result were amazing so thank u both so much, would definitely recommend SDM Images, thank u!! Don’t forget to check out my Facebook Page at www.facebook.com/sdmimages to see recent events & comments from both couples and their guests on what’s been going on so far this year.